Pluto swallows the soap while being bathed, then runs away. 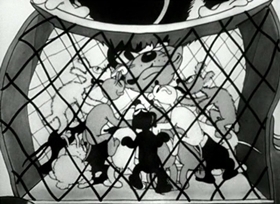 His soapy slobber makes locals think he's gone mad, and they call the dogcatcher to destroy him. I enjoyed the fun gag of the usually censored scene of the Chinaman dropping his laundry at the sight of the "mad dog" and running back into the laundry. The clothes he dropped also gets up and runs back into the laundry. The Chinaman is rather oddly portrayed as a duck (Peking duck?)! I have only seen this short once (on you probably guessed it GBTS). I kind of liked it, but I think that it would have been better shown complete. As Jerry Edwards points out above, the Chinaman scene (which I have never seen) looks like a Peking duck. That sounds like it might be kind of funny since the guy is Chinese and "Peking" is a Chinese word. 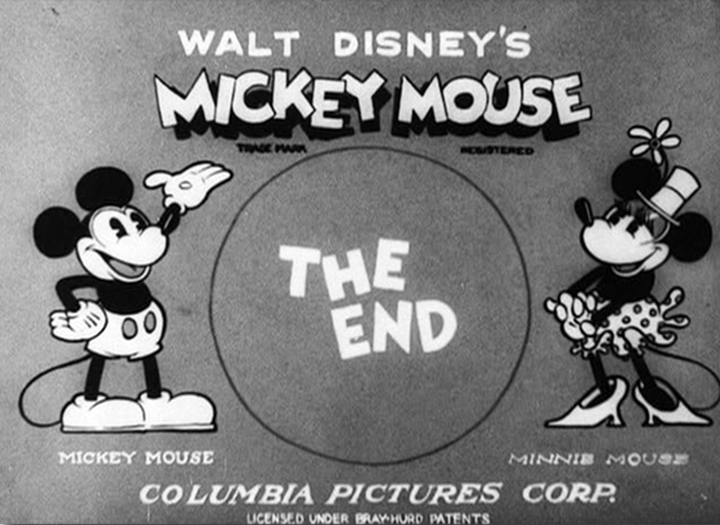 This is one of those many black and white shorts that Disney colorized so I have never seen the black and white version of it. Pretty funny, action packed short. 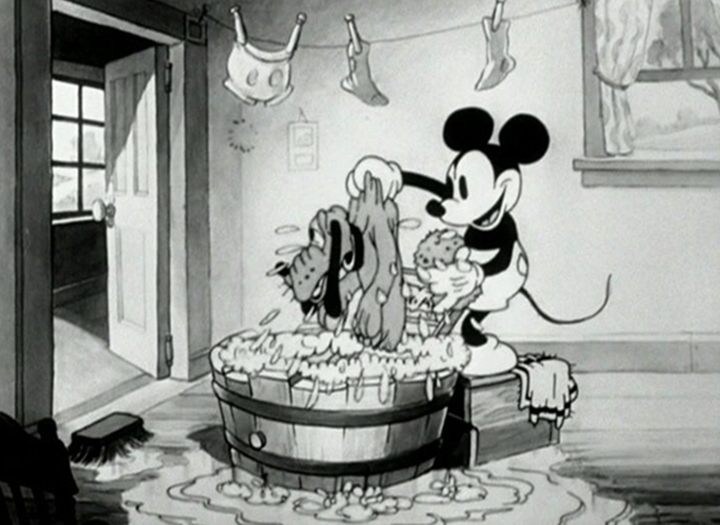 Here Mickey is trying to give Pluto a bath. Of course like all dogs, he hates it, gets away and in the process swallows a bar of soap making him foam at the mouth like a mad dog. 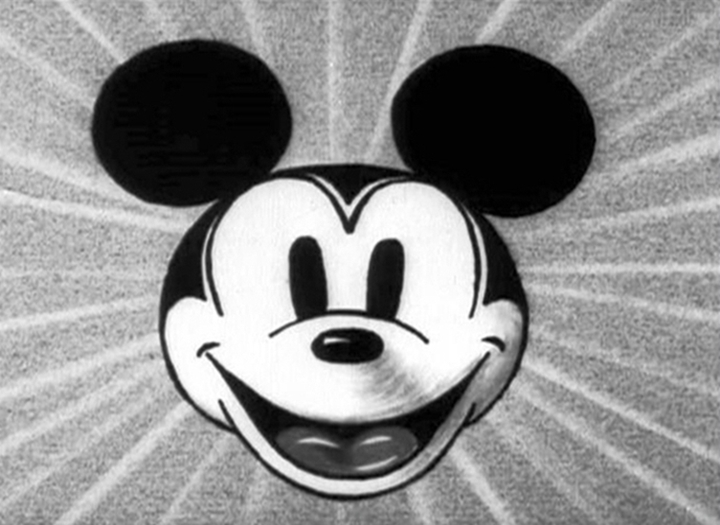 Now the action comes fast as Mickey tries to get him back. 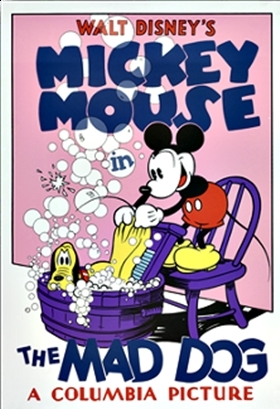 Many great gags like Mickey floating inside a soap bubble. I also thought the scene with the old cow lady (an "old" Clarabelle?) sees Pluto and runs and calls for help. And who else but Pete would be the dog catcher. Perfect. The scene where Mickey begs and cries for Pluto's life is moving, showing just how big Mickey's heart is. 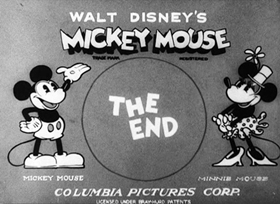 Great get-away from Pete, full of action and the best gag at the end is when the fleas, seeing that Pluto is safe, jump right back on him. I will give this one a solid 9 for action and gags. Pete’s back! Sorry to be so excited, but I love it when Mickey has a good villain to play off of, and seeing Pete in The Mad Dog gave me little bursts of happiness. 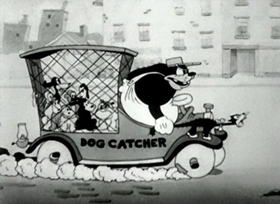 Unless I’m mistaken, it’s the first time that we’ve seen Pete the dogcatcher chasing Pluto. 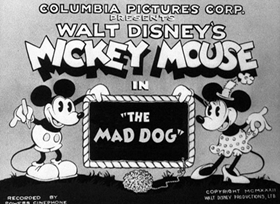 And, it continues Disney’s demonization of dogcatchers. Yes, we have seen the dogcatcher reviled in Alice the Dogcatcher and other shorts, and it continues here, although that is just the second half of this very fun short. 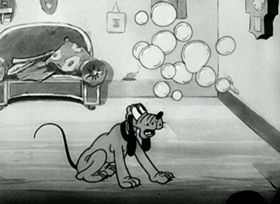 The main part of the short is around Pluto taking a bath, after which he swallows the soap and begins foaming at the mouth. 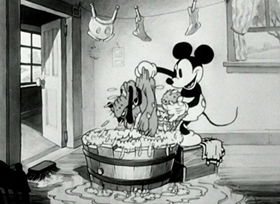 As could be predicted, when Pluto runs out of the house, trying to get away from Mickey, his soap suds lead people to think he’s a rabid dog. This leads to some great gags of people in the town running away from him. 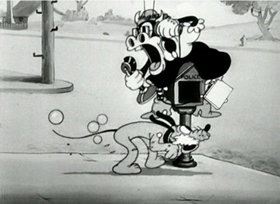 There’s an old cow who jumps on top of a police phone, a giant pig who tries to jump in a whisky barrel, and the Chinese laundry man who runs away and has the clothes he dropped follow along. These gags would likely be offensive today, but they’re still fun. The short is great in that it gives a little more meaning to the cliché of Pluto’s chase. We’ve seen Pluto causing mass chaos all over Mickey or Minnie’s house or yard, but this is the first time he’s been set loose in a city. It’s a great choice, because he gets a mob chasing him and gets Pete the dogcatcher involved, which is also great fun. 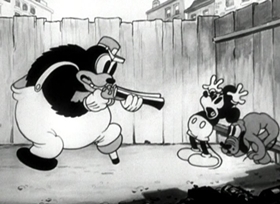 This is the Pete from Steamboat Willie, meaner and more of a villain. He drives his dogcatcher cart after Pluto, and corners Mickey and Pluto in an alley. 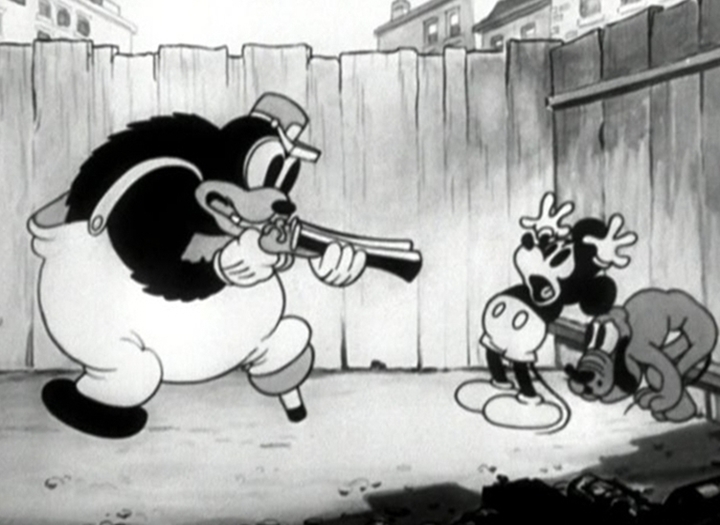 Seeing Mickey try to outwit Pete is one of the treats of any Mickey cartoon. Here, he slips our erstwhile friend the cat in Pete’s pants, and manages to slip out a hole that Pete accidentally shoots in the fence. 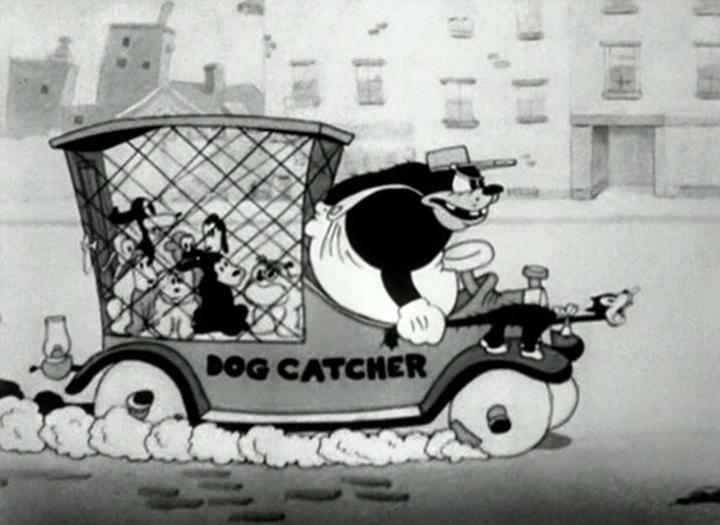 Pete chasing Mickey and Pluto through town is fun as well, as they use various and sundry carts or cars to try and escape, eventually catapulting Pete into the air and headfirst into his dogcatcher cart. I would write a great deal more about the quality of the animation or the artistry of this short, but neither are real standouts. Sure, Mickey and Pluto are fantastic characters, and you find yourself caught up in what they are doing and not watching for special tricks in the art or things like that. That’s a testament to where they have come from in the last few shorts. 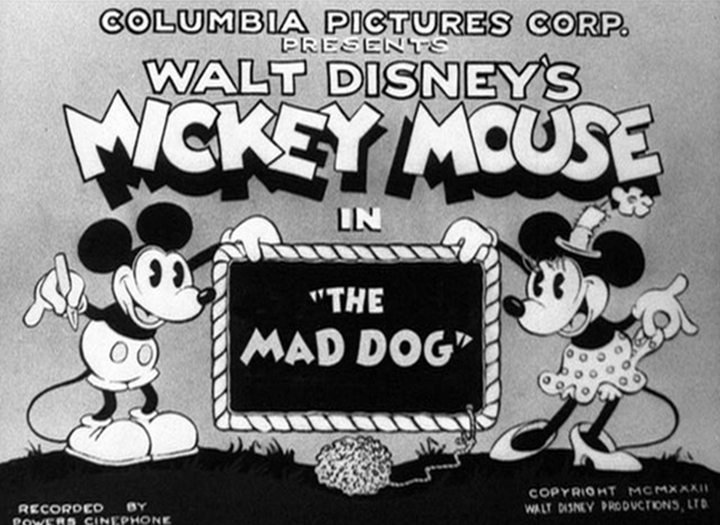 Sure, things are somewhat paint by numbers, filling out certain plot points in service of the fun Mickey/Pluto chaos, but it works and works well. Although this one doesn't feature anything really new and ambitious in terms of artistic choices, one thing that struck me was the quality of the animation. The drawings and movement are slicker and smoother than ever before.